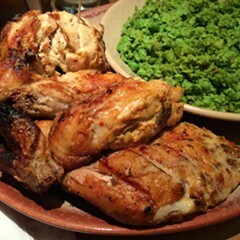 Is peri peri chicken the next battle in the poultry wars? 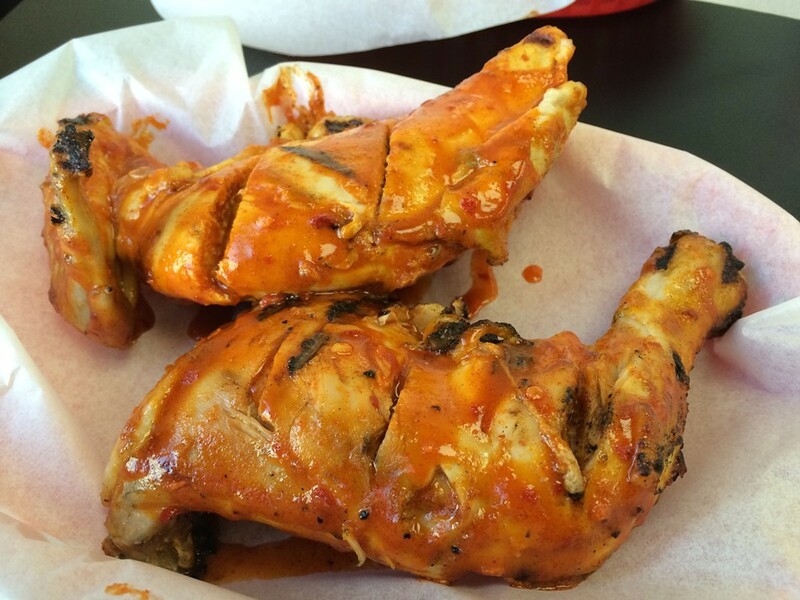 There's a new chicken joint in Skokie that specializes in Portuguese-style peri peri chicken. Peri peri—or pili pili or piri piri—refers to the red African bird's eye chile peppers the chicken is marinated and sauced in. 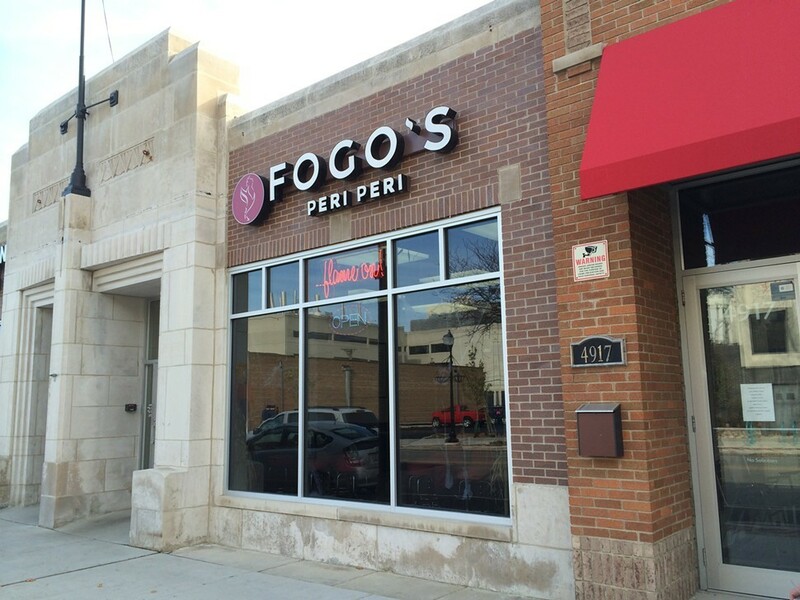 Fogo's makes the bold claim that they are the only outfit in the midwest that serves it. I guess they've never heard of Fat Rice. Well, to be fair there are different versions of it around the world. Fat Rice make Macanese-style piri piri chicken, and it's quite a bit more complex and interesting than the more straightforward Portuguese version. Abraham Conlon tells me they marinate theirs in a piri piri sauce (Seedling Farm grew 1,000 pounds of the chiles for them this year) with garlic, black pepper, bay leaf, and "trade secrets." "They key difference between the Macau style and all the rest," reports Conlon, "is that after the chicken has been chargrilled or roasted, it is bathed in a secondary sauce of coconut milk, tomato paste, peanuts, of course more piri piri chiles and then fired under the broiler one more time to reduce and encrust the sauce on the chicken." The best news I got from Conlon? 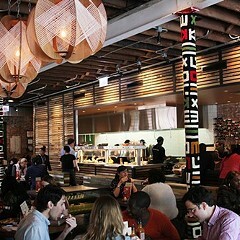 "Incidentally, we have also been planning our own piri piri chicken assault on the Chicagoland area." That's right. Piri piri chicken, to go, from Fat Rice. Coming soon. You read it here first. Maybe you've heard of Nando's, which is a South African chain with some 1,000 stores in 30 countries that is the worldwide piri piri chicken king. Fogo's, like Nando's also sells wings, wraps, and salads, and seems to have adopted that model. At Fogo's they claim to marinate the chicken in a piri piri sauce for 24 hours. From there it's precooked and deposited in a holding oven until ordered, then given just the briefest of kisses on a gas grill (that's important), before being slathered in piri piri sauce, which can be ordered to your preference on the Scoville scale. The chicken itself is . . . OK. It could use more time on the grill to crisp up. It could definitely use more time on a charcoal grill, which is how a proper Portuguese chicken joint like Montreal's Rotisserie Romados does it. Instead it has a sort of braised, fall-off-the bone quality to it. The sauce at Fogo's is quite good, if simple. It's fruity, with a bit less vinegar than your typical Louisiana hot sauce. It has a vivid almost disturbingly orange-red color, and the "hot" option leaves a nice sustaining afterburn on the lips. The problem is, the sauce is slathered on liberally, and not reduced in any way (like at Fat Rice), and it fairly disintegrates the tissue paper lining the baskets it's served in, which soon will have you worrying whether you're eating bits of chicken or bits of wet paper. Finally, the chicken is served half butchered—thigh connected to drumstick, breast connected to wing—which means you really have to get in there. The owners should consider installing a shower. UPDATE: No sooner did this post go up than it was announced that Nando's is opening three locations in Chicago this spring, in Lakeview at 670 W. Diversey, New City at 1500 N. Clybourn, and in the West Loop at 953 W. Randolph. War is coming.